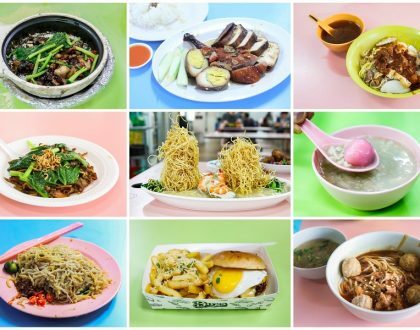 There is NO MENU at the Michelin Bib Gourmand, Anthony Bourdain recommended Sin Huat Eating House at red-light district of Geylang Lorong 35. Chef Danny Lee mentioned that in a tone equal in candidness and seriousness, as if he was many-times bitten, many-times (not) shy. 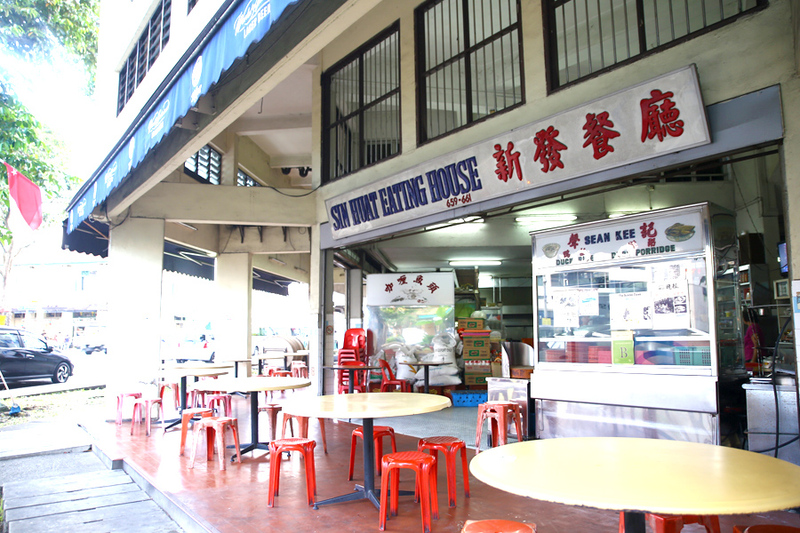 Sin Huat Eating House had received complaints and negative feedback from exorbitant prices, rude service and long waiting hours. This is almost a ONE-MAN SHOW restaurant. Chef Danny takes the orders, cooks, and then two aunties will send the food to our table. If you are at the last table, perhaps you literally have to wait-long-long before Chef would make his rounds. Tip: Order the Otah ($12 per piece), that was the fastest to come. I can imagine some diners may be offended by Chef Danny’s straight-talking, no-nonsense style. In a greatest faux pas (and lack of research), I asked if he served Har Cheong Gai… Mistake. ”Hello? We are a seafood restaurant. Is chicken seafood? I almost wanted to bury my head under the table. My friends had a good laugh. He went to comment that seafood restaurants which sell everything under the sky, shouldn’t be called “seafood restaurants”. ”Don’t get me there… I was more amused than anything. Be very precise in what you want to order and not. I mentioned ”Zhong yu” which meant “finally” in Mandarin, he thought I wanted a medium-sized fish. My heart stopped a beat when I realized that could have cost me an additional $300. Our orders were the legendary Crab Bee Hoon ($160 for 2 crabs), Prawns ($84 for 14 pieces), Scallops ($50 for 2 kg, that was like 12 pieces? 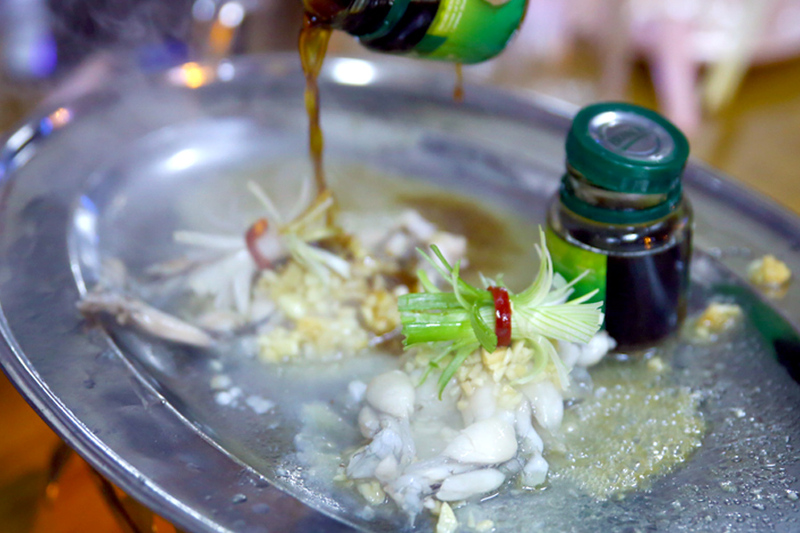 ), Frogs’ legs with essence of chicken ($26 for 2 frogs), and Vegetables ($20). A word of caution: The kitchen was heavy-handed in using garlic. 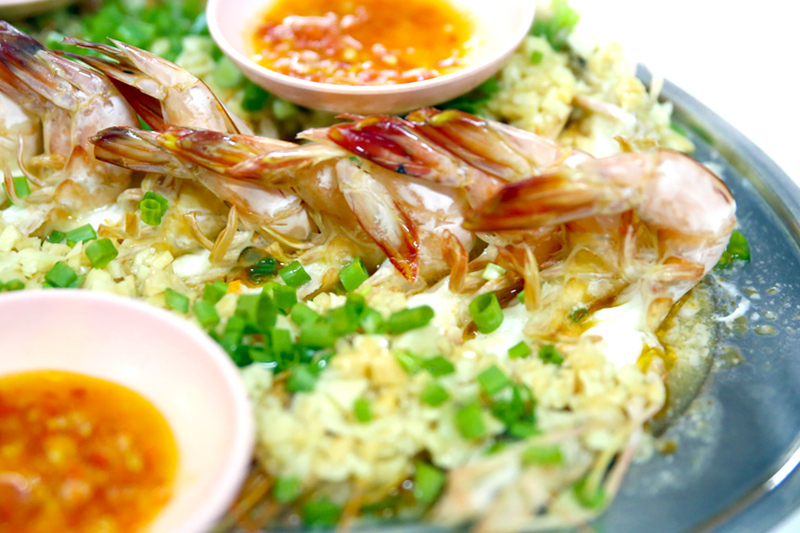 If your nemesis is garlic or you are a Dracula, stay far-far away from Sin Huat. We all had our personal favourites. Mine could be the Otah ($12 per piece) which Chef Danny described as “size of your handphone”. Should be a Samsung Note 7. 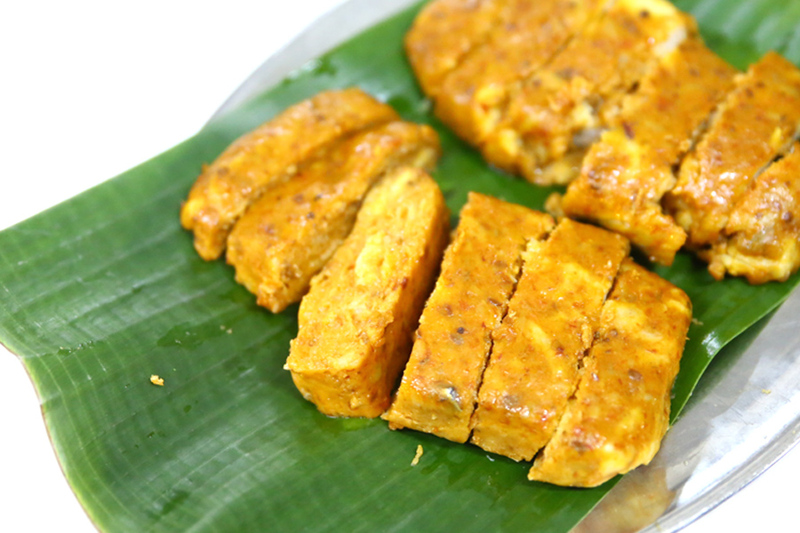 The handmade piece was spicy-sweet-juicy, served on banana leaf with chunks of fish which my friend described as “better than Muar’s”. 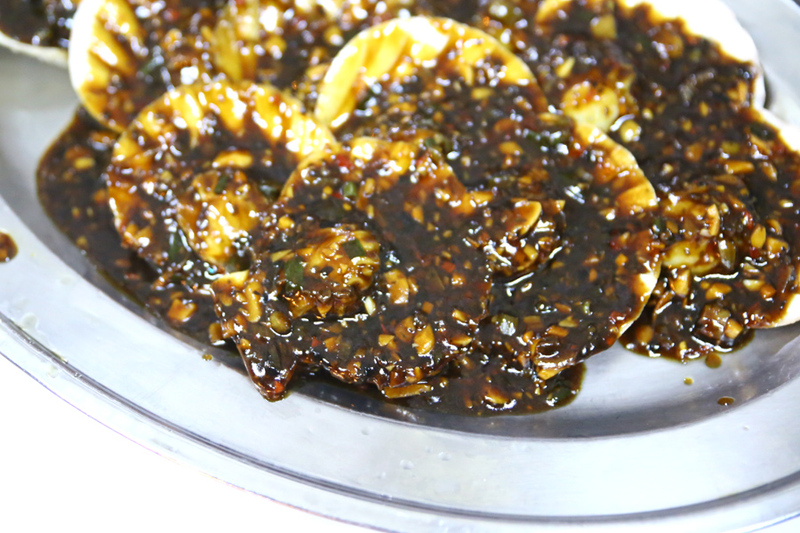 We were divided on the Scallops ($50 for 2 kg) cooked slathered with black bean sauce. The scallops were fresh, but the sauce and abundant use of garlic kind of covered the taste. While some others thought otherwise and scooped up the sauce till there was not very much left. I had a love-hate relationship with the vegetables ($20). 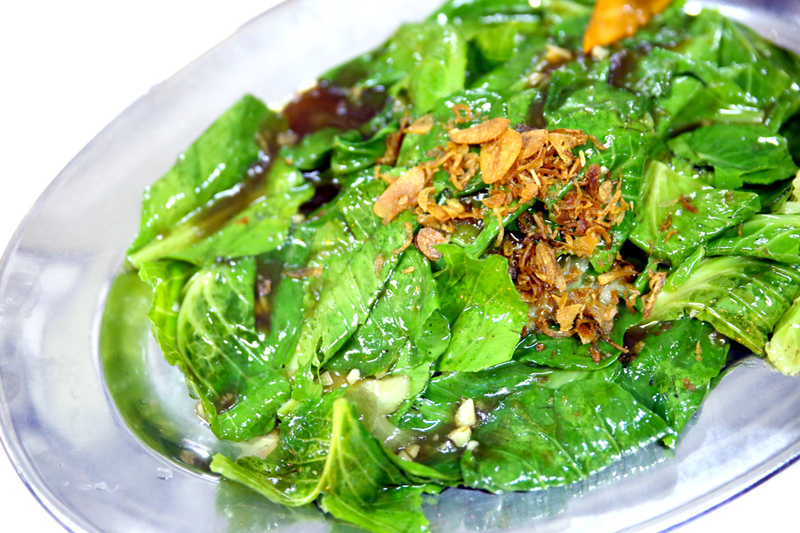 Chef Danny said he had greens there ONLY because he ”yi si yi si” needed a token vegetable dish. The dish was deliciously over-salty in oyster sauce. Try it to know what I mean. 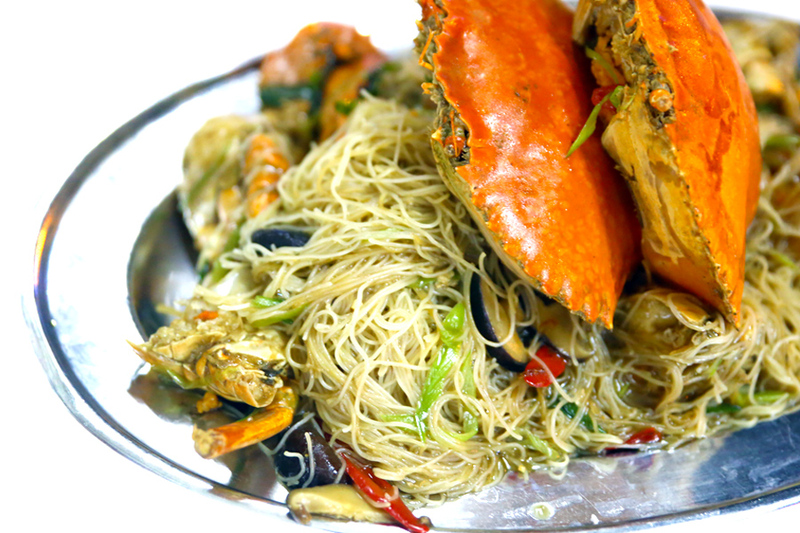 Of course the star of the dinner had to be the Crab Bee Hoon ($168) had rice vermicelli drenched in this impossible-to-resist sauce, with wok-hei and crabs so fleshy-sweet you wave your diets goodbye. Elsewhere you might get crabs so dry and shriveled, and without SO MUCH roe, that you wondered if they had lived in vain, or been cooked in vain. I wished for MORE bee hoon per crab, but got reminded that this had to be done so that every strand would get wrapped with the essence and flavours. 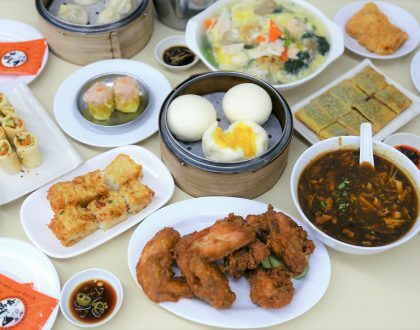 The Singapore Michelin Guide listed the price at Sin Huat to be between $20 and $40. 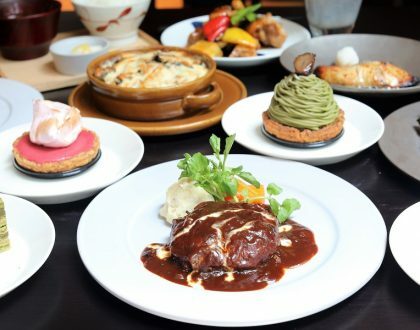 They could have come in a big big group and ordered only 2 dishes. Anyway… expect to pay anything between $50 to $100 and beyond per person. Anthony Bourdian did name Sin Huat as one of the “13 Places to Eat Before You Die” alongside Per Se, elBulli, The French Laundry, Le Bernardin, and Sukiyabashi Jiro… which showed how worthy he thought the food was. 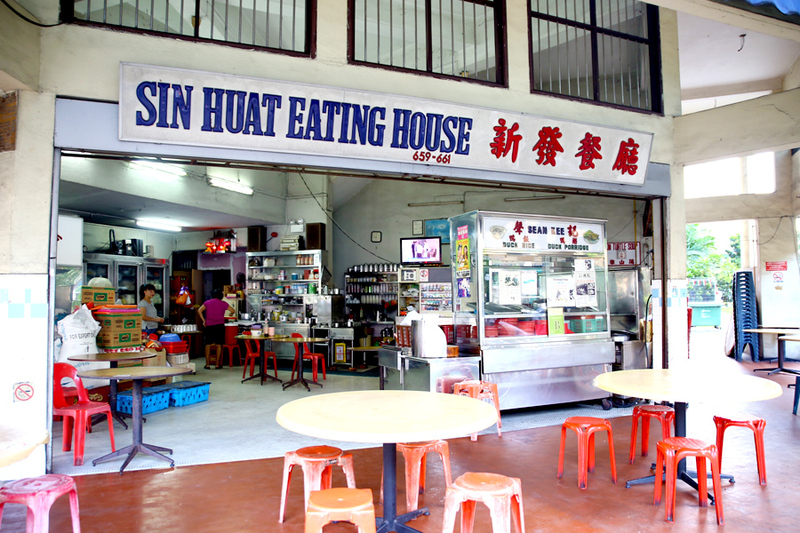 I think Sin Huat should provide you a unique local dining experience (may just return again for the bee hoon, otah and vege). Bring extra cash to pay your friend (they accept cards), wet towels, patience, an appetite, and throw your pride out of the window. And DON’T order chicken. I just went to this resturant last saturday (4th Mar 2017) per your opinion. This must be a paid ad, and its the worst seafood I have ever tasted in my life.Only 2 table of customer & we (8pax) are one of them. 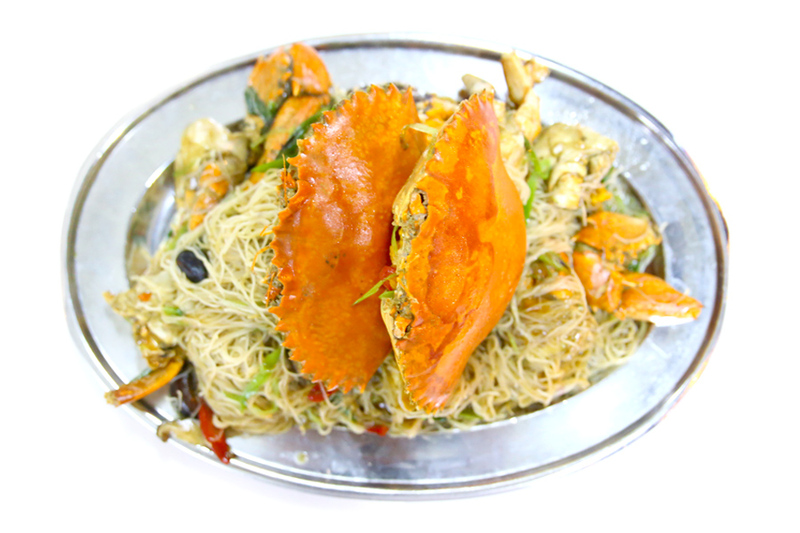 Ordered Otah,Scrimp,scallop,crab beehoon,shell,veg,4rice, paid $451. Garlic shrimp & Otah was really good. 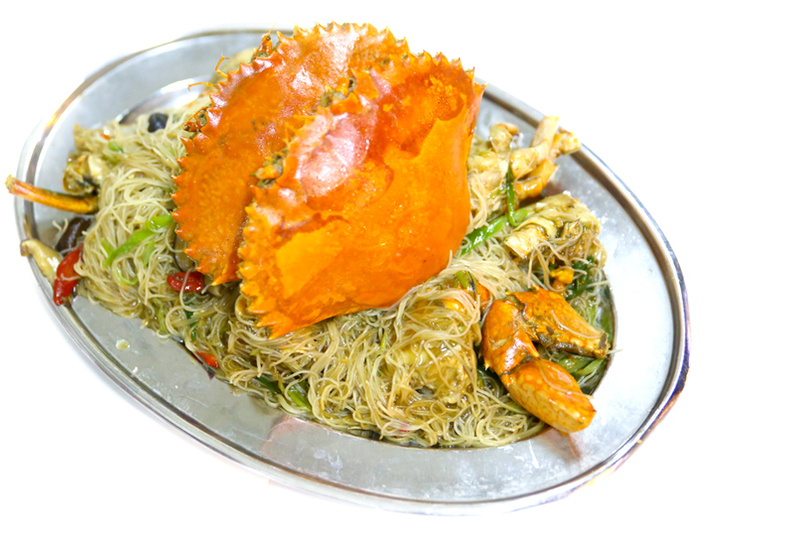 But the most expensive Crab beehoon costing $203 was a obvious dead (steam to preserve)tastless crab. Though size is reasonable, but its a tastless crab. Attitude of staff was bad, and they been pushing us to over order which we can easily tell from it. Seafood tank are empty and dirty. Strongly do not recommend this place for dinner. Hi Eileen, as indicated in the post, I paid for my own meals. As mentioned in the write-up, the service is not the best you can expect around. Lousy service , Super over price ,crab is literally bad. Meat texture is like mash potato. Probably the worst I tasted. Use to be good but not anymore. A definitely no go place. Just had dinner with friends there, agreed with everything Daniel mentioned. BUT! After tasting the crab bee hoon, ohmygod ! It is definitely THE BEST I’ve ever tried, and everyone in the group felt the same as well. Yes, it is pricey. and yes, the service is not the best. but its not terrible either, and the quality of good makes up for everything ! ”Hello? We are a seafood restaurant. Is chicken seafood? So he means frog leg are seafood? he got study a not?